One rainy afternoon in 2002 at Harrods, I sketched a quick impression in my journal of these two men in black. Their incongruous presence in London’s poshest department store was a stark contrast to the colorful array of culinary delights for which Harrods great food hall is world renowned. Upon further reflection, this sighting revealed another level of strangeness. It seemed that by some trompe l’oeil, they had been transported through time from a cobblestone street in 17th century Poland to our era of consumer opulence and gastronomic bounty. 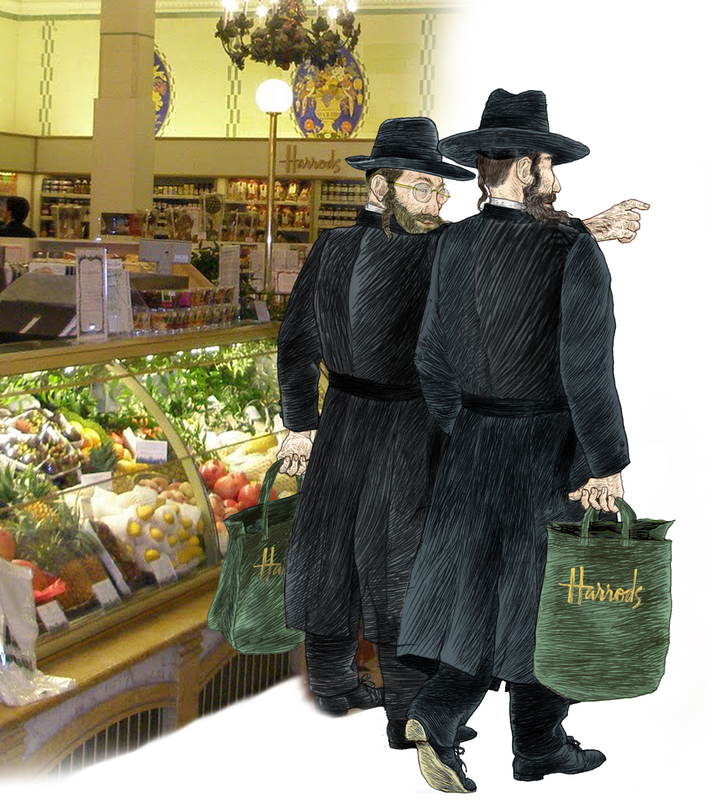 Taking in their stuffed shopping totes, I wondered if they were still committed to their ascetic culture as they searched for a way out? And where were their wives? Questions, questions; but what fun would life be without mysteries like this? This entry was posted on May 9, 2012 at 7:11 AM and is filed under Imaginarius Updates. You can follow any responses to this entry through the RSS 2.0 feed. You can leave a response, or trackback from your own site. Ilene, Hassidut does not espouse asceticism — far from it! While some branches of Judaism believe in rising ABOVE the physical realm, hassidut believes that the greatest potential for spirituality exist WITHIN the physical realm — when it’s used with the right intentions. Thanks for your comment, Leah-Perl. Perhaps the term asceticism was a bit extreme, but among some of the very observant that I have known, much of the cultural trappings of our society are eschewed in favor of attaining and preserving a more genuine spirituality. This doesn’t preclude the foundation of joy in the religious life , it just puts it in a different perspective.